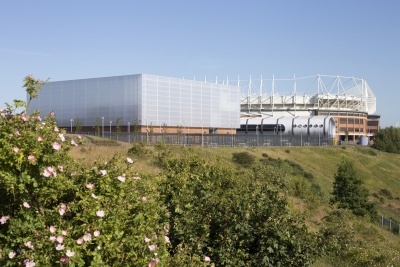 The Beacon of Light is a unique landmark in Sunderland providing educational aspiration through the power of sport. It is a combination of a school, offices, a 12-court sports hall that doubles as a 3000-seat performance venue and an indoor football pitch on the roof. In total over 10,500m2 of accommodation is provided, built to a very high quality, for only £17M. Architecturally it is a significant feature on the Sunderland skyline and a beacon for the Foundation of Light. keep the amount of piling to a minimum thus reducing environmental impact. allow the M&E flexibility by creating clear soffits in the main service run directions keeping coordination simple and fabrication modifications, such as holes in beams, to a minimum. create a 60m by 32m clear span sports hall that can be converted into a 3000-4000 seat performance venue that has a football pitch over it. It has five different possible uses planned and is designed to be so flexible that the adjacent main accommodation at the upper levels is supported by super trusses to accommodate extra viewing and seating zones with uninterrupted views. design a very lightweight and very shallow two-way spanning fabric roof structure and a feature ‘Beacon’ polycarbonate façade that can come alive at night with lighting. create a building that fits the superb architecture, within the tight budget, to a very high aesthetic standard. 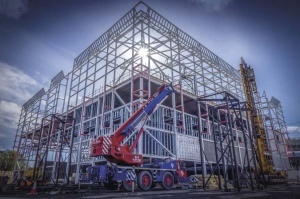 Steelwork Contractor Harry Marsh (Engineers) Ltd.
A new landmark in regenerating Sunderland, this glowing cube of a building, a home for the Foundation of Light, is a community supported combination of school, sports halls and 3000-seater performance venue. It even includes a covered football pitch on the roof. The steel frame economically resolves structural challenges from foundations to its 60m by 60m clear span fabric roof.